Members of PlanetS have joined the worldwide race to spot the alleged ninth major object in the outer Solar System. Researchers at the University of Bern study the evolution of such a planet and estimate its visible magnitude. The call by Stéphane Udry to all members of PlanetS sought to encourage consideration of some basic questions. What kind of emission can we expect? At what wavelength must it be observed for optimum detection? Where should we look? Can we predict its position using dynamic constraints? How can we organize campaigns of observation and on which instruments? Possible answers will come only through joint involvement between dynamicists, internal structure theorists, atmosphere experts, observers, and many good wills. This good will must be quick to appear, and in fact Esther Linder and Christoph Mordasini, two members of PlanetS at the University of Bern, just submitted a paper in which they tried to estimate the evolution and magnitude of Planet 9. According to this paper, Planet 9 would have a visible magnitude of 20 to 22, a mass of less than 20 times that of Earth and a radius equal to 3.6 Earth radii. In addition, the temperature of Planet 9 would be around 47K and is well above its equilibrium temperature suggesting that internal mechanisms could “heat” the planet. 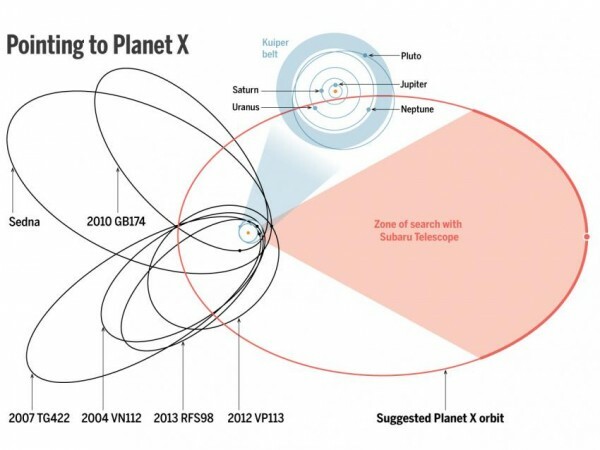 Part of the orbit has already been observed long before the “discovery” to exclude a priori the presence of Planet 9 in certain part of the sky. Linder and Mordasini conclude their investigations into considering that the LSST telescope currently under construction near the Cerro Tololo in Chile could be the most appropriate instrument to flush out Planet 9 if it exists. Indeed, with its 3000 Megapixels camera the LSST will make a survey of all the southern sky in just three nights.